Soft pink and delicate whites, hand-picked and hand-chosen by our expert local florists. 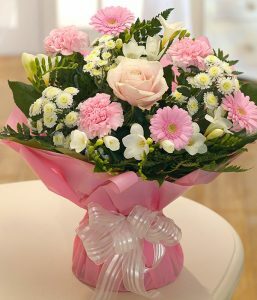 This aquapack flower arrangement will be made of the finest and freshest soft pink and ivory stems. 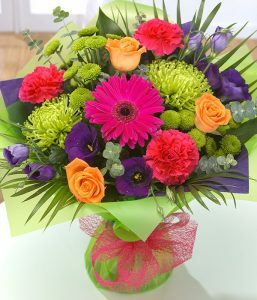 Make you Mum smile this Mother’s Day with this pretty arrangement. 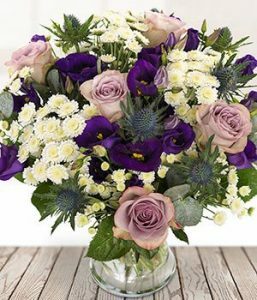 We will personally create your bouquet using the finest and freshest Purple, lilac and white stems. The flowers are hand-picked and hand-crafted for the best possible gift. Our choice mix of the finest, most vibrant stems will be hand-made and hand-delivered by ourselves. The flowers are hand-picked and hand-crafted for the best possible gift. 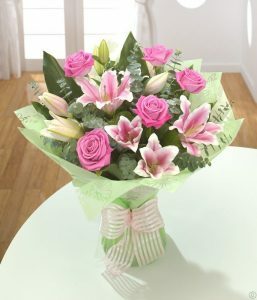 A hand-tied explosion of the roses and lilies. A classic design for Mother’s Day.